James Wescoat, Dario Debowicz, and Sherman Robinson. • Multi-year storage in the Indus Basin remains limited. • Water and food demands are likely to increase on a per capita basis and in aggregate terms, as population increases. Reliance on groundwater resources will continue. Falling water tables and increased salinity in many places may worsen. • An array of allocation entitlements economically constrains the waters available for agricultural production and coping with climatic risks. • Low water-use efficiencies and agriculture productivities are top concerns. • A common set of water and agricultural policy challenges is complicated by several dynamic stresses and institutional shifts, including constitutional devolution from national to ­provincial levels. • Most national and provincial development plans continue to focus on the role of infrastructure in addressing challenges of water and food security. • Recent policy documents highlight the increasing importance of improving irrigation efficiency, improvement of yields, and the socioeconomic distribution of development opportunities and benefits, including food security. • The important role that water management plays in the productivity of the agriculture sector is recognized in many different forums and policy reports. However, these linkages are not always comprehensively addressed (with systems-based models) in federal and provincial planning documents and budgets. The Indus Basin Irrigation System (IBIS) has undergone profound changes and experienced increasing stresses in recent years. Several recent studies have heightened awareness of Indus water resources issues, notably the World Bank study Pakistan’s Water Economy: Running Dry (Briscoe and Qamar 2006). That study convened a team of experts to identify broad challenges and strategic choices facing the water sector in Pakistan. (4) low water-use efficiencies and productivity. It is well known that South Asian countries have a lower proportion of water storage and hydro-power development than other regions of the world, both in relation to their geographical potential for storage and power generation and in relation to per capita water and energy use (figure 2.1). (3) in wet years they have helped expand irrigated area and reduce the degree of deficit irrigation. (5) Encroachment into flood plains and riverine areas. Post-flood assessments underscored the imperative of non-structural as well as structural measures, and their relative and joint significance have yet to be established. (2) increasing rates of groundwater pumping. Although the population growth rate in Pakistan has been declining, it is still 1.8 percent annually, which portends escalating demand for water, food, and fiber crops (World Bank 2012b). Even with the relative decline in the population growth rate, today’s 174 million are projected to be 238 million to 314 million by 2050 (UN Population Division 2012) (figure 2.3). Will land and water resources suffice for this population? Moreover, water availability per capita has fallen drastically from 5,650 m3 in 1951 to 1,000 m3 in 2010.And by 2025, this number is projected to fall to 800 cubic meters (m3) per capita (GPPC 2007), well below the 1,000 m3 per capita limit below which the supply is defined as “water insecure” (Falkenmark et al. 2007). Land use from the late-19th to early 20th century involved a dramatic shift from a pastoral landscape punctuated by localized shallow well irrigation to the largest contiguously managed canal irrigation system in the world (Bedi 2003). By the second half of the 20th century, private tube-well development had accelerated (figure 2.4) as a means to reduce water logging and provide a more reliable and timely water supply for irrigation (Michel 1967). These processes enabled the reclamation of agricultural land to grow. Cropping intensity also increased in many areas from one to two crops per year, which has contributed to the continuing growth of withdrawals for agriculture. More recent data suggest that tubewell development has been leveling off during the current decade, perhaps due to increasing pumping costs, unreliable fuel supplies (mainly diesel), and decreasing groundwater quality. Irrigated land increased at an average annual rate of almost 1 percent from 1992 to 2008 (Government of Pakistan, Ministry of Food, Agriculture, and Livestock 2010). Figure 2.5 shows the change in irrigation source over time (Van Steenbergen and Gohar 2005). Indeed, most farmers are currently using a combination of canal and tubewell water, while a smaller proportion relies solely on tubewells. Food and Agricultural Organization of the United Nations Statistical Database (FAOSTAT 2012) data estimate groundwater withdrawals at 34 percent of total withdrawals for all uses, which is probably conservative. Canal irrigation remains enormously important, though it has been slowly declining as the predominant source of water. Further opportunities for expanding irrigation into areas of rainfed (barani) cultivation are limited, although they include expansion of private tubewell irrigation,watercourse extension,and high-efficiency irrigation technologies that can operate on uneven terrain (for example, drip systems). These opportunities vary by province. Increasing reliance on groundwater is no doubt related to problems of waterlogging, salinity, and, in some areas, groundwater depletion. Before an extensive canal irrigation network was developed in the Indus Basin, it was a land of monsoon-flooded riparian corridors between the dry upland plains of the great doabs and deserts. As irrigation historians of the Indus have shown, the colonial and post-colonial canal system had extensive seepage and spread vast quantities of water over the land that raised the groundwater table dramatically (figure 2.6; Gilmartin 1994). Drawing down groundwater can improve the waterlogging situation, but it can also increase pumping costs or it can tap into increasingly brackish waters. Figure 2.7 shows the particularly high proportion of shallow groundwater in Sindh province, although it varies across years. A closer look at recent well records of water table depths shows significant differences over space and time. In the northern district of Sialkot in Punjab, for example, where water table levels are relatively high, water tables have fluctuated between 4 and 16 feet below the surface (figure 2.8). The overall regional pattern shows decreasing water tables, thus decreased waterlogging, in the basin. To understand the potential impacts on agricultural production and yields, the variability of water levels and waterlogging must be compared with changing irrigation patterns and climatic conditions. The areas affected by waterlogging and salinity have been monitored, but the costs of this environmental degradation are difficult to estimate. A recent study by Bhutta and Smedema (2005) noted that the direct annual agricultural damage (not counting the lost opportunities of more profitable land use) is estimated to be on the order of PRs 20 billion per year. Waterlogging and salinity have also adversely affected public health and sanitary conditions in the villages. A more recent national estimate of the economic impacts of salinity on agricultural production examined two scenarios, one that emphasizes cotton planting on the most saline lands and the other, wheat. Estimated crop production losses ranged from PRs 30 to 80 billion in 2004 prices (World Bank 2006, 26). Groundwater quality issues are even more spatially complex and pose variable threats to agricultural sustainability. Overall salt balance models have been estimated, but as Ahmad and Kutcher (1992) have shown, the main challenge is modeling the dynamic spatial distribution and transport of salts through the irrigation system.As with waterlogging hazards, salinity hazards tend to accumulate downstream, affecting as much as 50 percent of the land in Sindh. However, recent village surveys indicate improvements in waterlogging and salinity in upper Sindh, as contrasted with increasing concerns in the deltaic region of Badin and Thatta districts (Berger and IAC 2011). Even in Punjab, salinity conditions vary by sampling well locations within a district and over time. An array of entitlements—from individual timeshare water rights (warabandi), to canal indents, a provincial water accord, and the Indus Waters Treaty (IWT)— shape the waters available for increasing agricultural production and coping with climatic risks.While private groundwater pumping is not regulated, surface water allocation institutions were designed with limited flexibility that constrain production under conditions of hydroclimatic variability and changing crop production technologies and functions. Additionally, these inflexible institutions have been routinely subverted to effect changes that privilege one group over another, undermine trust, and increase singular perceptions of even more widespread distortions. Two examples follow. Since 1991, water inflows have been apportioned among the provinces by the Indus Water Accord. The Accord of 1991 allocated annual flows among the provinces based on a five-year record of pre-Accord historical canal diversions. The Accord, which was based on the assumed average flow of 114.35 MAF of water in the Indus system, allocated 55.94 MAF of water to Punjab and 48.76 MAF to Sindh province, the remaining 9.65 MAF was divided between North-West Frontier Province (NWFP, currently known as Khyber Pakhtunkhwa) and Balochistan provinces (Mustafa and Wrathall 2011). Table 2.1 shows the minimum lump sum allocations across the cropping seasons. The Indus River System Authority (IRSA) was set up by the Accord of 1991 to manage provincial water demands for reservoir releases and distribution to canal commands. The “Council of Common Interests,” was introduced in the 1973 Constitution and reconstituted in 2009. It takes up disagreements among the provinces. IRSA does not have effective structures or mechanisms for regulating its political representation and technical administrative roles; the former is sometimes perceived to dominate the latter. In 2010, IRSA faced rising tensions leading to resignations and near-dissolution of its membership. Provinces have full authority to allocate their apportioned waters to various canal commands within their boundaries, which they do on a 10-daily operating basis. Few major canal commands cross provincial boundaries (though significant river flows, groundwater discharge, and drainage flows do cross provincial boundaries). While the Accord provides for excess flows and redistribution within provinces, it does not provide for extremely low flow conditions or negotiated transfers among provinces. A key analytical question is: How do these institutional constraints affect agricultural production patterns, values, and efficiencies? Low water-use efficiency and agricultural productivity are top concerns for the Government in Pakistan. Frequent comparison between low irrigated crop yields in Punjab, Pakistan, and Punjab, India (Ahmad 2005) find that both regions have lower yields compared to elsewhere (table 2.3). These comparisons are striking, but they are not as simple as they appear. Figure 2.10 shows that there has been slow growth in the overall trends in crop yields from 1991 to 2008 for all but maize. This may reflect a wide range of agronomic, economic and technological factors.To what extent are yield differences based on water allocation differences, as compared with other inputs and resource conditions? Low water-use efficiencies raise a comparable question. Efficiencies in the IBIS system comprise canal efficiencies, watercourse efficiencies, and field efficiency, measured as a percentage of water delivered relative to the amount withdrawn. When multiplied, they give a measure of system-wide water-use efficiency. Typical losses in Pakistan are shown in table 2.2. Some irrigation scientists argue that subsequent reuse through pumping of canal seepage should be added, which would lead to higher estimates of system efficiency (Jensen 2007). Others argue for a shift from physical water-use efficiency to water productivity, measured either in terms of quantity of crop produced per cubic meter diverted and delivered, or in terms of the net caloric or economic value of that crop per unit of water (Molden et al. 2010).There are many ways to increase water productivity, from established techniques of watercourse improvement, precision leveling, and on-farm water management, to substitution of high-efficiency drip and sprinkler irrigation technologies for some crop and land types, as well as shifts to new crop types, varieties, and cultural practices. In a large system like the Indus, these alternatives have complex spatial as well as technological and economic linkages that need to be addressed through quantitative modeling. National policies affect all sectors related to Indus Basin management. Of particular relevance are a recent constitutional change and a suite of long-term and short-term economic plans and budgets.These plans have had to address volatile economic and political conditions. During the past decade, Pakistan’s real rate of gross domestic product (GDP) growth increased from 2 percent in 2001 to 9 percent in 2006 as a result of a combination of economic reforms, the end of a multiyear drought, and increased foreign funding related in part to the conflict in Afghanistan. Increased growth reflected a combination of international and domestic factors. Pakistan took on a large international debt position during this period, which made it vulnerable to shocks such as the Kashmir earthquake in 2005, the global food price spike in 2008, and the ensuing economic recession, and Indus floods of 2010—all of which contributed to the drop in GDP growth rate to 2.7 percent by mid-2011 (World Bank 2012b). An IMF (2010) standby agreement extension strives to manage debt, in part through fiscal policies such as increasing tax revenues, privatization, and lowering subsidies. International economic pressures, coupled with domestic and international security problems, have eroded funding for water and agricultural development. The 18th amendment to the Pakistan Constitution, passed in April 2010, eliminated the concurrent list of federal and provincial responsibilities and devolved most of the functions on that list to the provincial level. These functions include agriculture, including livestock and dairy; environment; and water management. As an autonomous federal body, the Water and Power Development Authority (WAPDA) remains at the federal level, albeit with responsibilities limited to large water infrastructure planning, construction, and operations. As the Pakistan Meteorology Department (PMD) is under the Ministry of Defense, it also remains at the federal level.This constitutional change means that assessments of climate impacts and adaptation must devote increased emphasis on provincial planning, management, and governance. Further devolution of water management responsibilities to local government bodies has been attempted during the past decade and may resume in the future. Vision 2030 proposes to address these gaps and minimize the impact of climate change in part by embracing the “gene revolution” (GPPC 2007, 53). Therefore, it is important to ask how crop breeding may affect water demand and, conversely, how hydro climatic change could affect the productivity of new varieties. These uncertainties lie beyond current modeling capability and this report but may be an area for future investigation. At the same time, while Vision 2030’s projected crop yields increase relatively steeply between 2005 and 2010, but flatten out over the next 20 years (table 2.4), the question is whether these targets are sufficient to meet food demands, given the future population demands and potential climate change impacts. This question is addressed in subsequent chapters on modeling. Finally, the Vision 2030 report—using the threshold of 1,000 m3/capita after 2010 and assuming a persistent high population growth rate—argues that an additional 12 MAF of storage is needed. This also incorporates the current observed reservoir sedimentation and future projections of increased general circulation model (GCM) monsoon rainfall of 20–30 percent. Similarly, a panel of economists submitted recommendations for the next Medium-Term Development Imperatives and Strategy for Pakistan for a five-year period, 2010–2015.5 The “Panel of Economists Final Report” (2010) envisions the agricultural growth rate to average only 3.7 percent, due in part to water constraints (table 2.5). The report urges increased irrigation efficiency, which it describes as averaging only 37 percent (due to canal, watercourse, and field losses). It criticizes the fiscal shortfalls of an irrigation revenue system (abiana) that recovers only 35 percent of its operation and maintenance costs.The report further recommends accelerated adoption of Bt cotton to emulate India’s dramatic increase in yields in Bt cotton since 2002. The panel also advocates preparing for climate change, though it does not draw upon any current research or make specific policy recommendations. Note that the previous mid-term development framework (MTDF)(2005–10) gave more detailed attention to physical water infrastructure investment. It cited the limited reservoir storage capacity in Pakistan, storage losses due to reservoir sedimentation, and irrigation seepage losses that are estimated to be 65 MAF or 61 percent of the water diverted into major canals (table 2.2). Moreover, it sought to lay out a comprehensive framework for water resources management, along with support for 36 continuing and 15 new water infrastructure projects, totaling more than PRs 276 billion over five years.The Agriculture chapter of the MTDF, by comparison, makes limited reference to issues of water management, which reflects a sector gap between irrigation and agricultural policy. Current federal economic plans and budgets shed light on a number of policy issues relevant for addressing climate risks, water, and food security in the near term.There is increasing recognition of climate change issues in federal planning, but no climate policy has been included in an annual or five-year development plan or budget to date. A climate change strategy was approved by the Federal Cabinet in January 2012, and a new Ministry of Climate Change was created in March 2012 that could guide future planning and budgeting. The strategy gave heavy emphasis to adaptation in the water, agriculture and livestock, forestry, disaster preparedness, and vulnerable ecosystems (mountains, coastal zone, rangelands, wetlands), and human health. It also includes a mitigation section focused on energy,transport, and industries. Despite this emphasis, current development plans do not indicate where climate change risks would be addressed at the federal level. The Pakistan Planning Commission needs to consider alternative agency and inter-agency organization for climate change policies and programs. The Planning Commission and Ministry of Finance will also need to consider the linkages between climate change and disaster risk reduction policies. Devolution of former federal sectoral functions to the provinces under the 18th Amendment will require stronger policy linkages between the federal water sector and provincial agricultural sectors. This will require vision and budget support at the federal level. The primary policy document in the water sector at the federal level is the WAPDA Vision 2025, developed in 2001, which describes WAPDA’s long-term infrastructure development plan. Proposed water projects are described on the WAPDA web pages and are almost entirely physical infrastructure projects (no reference to climate change). The written report, updated in 2004, presents the overall context and rationale for these projects. WAPDA has prepared a “Developmental Plan” that focuses on strategic issues and infrastructure completed, planned, and phasing; it makes no reference to climate change. A major Water Sector Strategy was drafted in 2002, and adopted in 2005, but still remains in draft form. Thus, there is no strong policy linkage between WAPDA’s Vision 2025 for reservoir and hydropower infrastructure investment at the national level to increase storage and hydropower capacities, on the one hand, and the various provincial water sector policies that must address issues of water demand management and agricultural productivity, on the other. National water policy is articulated in the Annual Plans of the Planning Commission and budgets of the Ministry of Finance. The most recent Annual Plan 2011–2012 introduced the “Water Resources” sector as a balanced program of supply augmentation and irrigation management. The water sector plan and budget for 2010–11 had ambitious aims that had to be dramatically scaled back due to the 2010 flood and budget cuts. Quantitative targets in the two most recent plans indicated declining physical achievements and targets both before and after the 2010 flood. Although the plans indicated a partial shift from large projects to small- and medium-size projects, there are continuing efforts to advance Basha-Diamer and other large storage and hydropower projects central to WAPDA’s Vision 2025. (5) legislation in the form of a Seed Act Amendment Bill and Plant Breeders Rights Bill. The task force recommendations focus on agricultural growth through increased yields, a shift to higher value horticultural crops, and increased investment in the high-value livestock and dairy sector. Attention was also given to enhancing agricultural water management and water-use efficiency through precision land leveling, watercourse improvements, water-efficient irrigation technologies, low delta water crops, and promotion of water saving technologies like drip and sprinkler irrigation. The report identified water as a major constraint in agriculture. A serious structural and administrative barrier to achieving the production targets set in the report is the stressed irrigation system, which is stressed due to inadequate maintenance and inefficient water use that adversely affects the water balance. Water shortages are particularly severe in the southern part of the country where irrigation has expanded into some of the driest regions. The non-economic water prices also provide no incentive to adopt recommended cropping patterns and water-saving techniques. Although the national water policy provides a legal framework for water pricing and cost recovery to ensure effective and efficient water management, its implementation is poorly managed. The inefficient use of water was cited as one of the major issues in the comparably low levels of crop productivity—Pakistan’s cereal production of 0.13 kg per cubic meter of irrigation water compares unfavorably with 0.39, 0.82, 1.56, and 8.7 kg in India, China, the United States, and Canada, respectively (Kumar 2003). The task force further recommended a two-pronged strategy for the development of water resources to attain and sustain food security in Pakistan. First, attention should be paid to reducing water losses and improving conservation of available water resources to enhance productivity and increase cropping intensity. This task should include the continuity of ongoing development projects (watercourse improvement and high-efficiency irrigation systems), and expanding the coverage of new initiatives and pilot activities, such as laser land leveling and permanent raised bed, furrow irrigation. Second, new small-scale irrigation facilities in rain-fed areas and poverty pockets of fragile eco-zones should be developed. It is estimated that the present cropped area of 58.5 million acres can be increased by at least 12 million acres from the available culturable wastelands of 20.6 million acres in the country. The Government of Pakistan Planning Commission set up a Task Force on Climate Change in October 2008 to provide appropriate guidelines for ensuring the security of vital resources such as food, water, and energy. Their final report, drafted in February 2010 (GPPC 2010), contributed to the formulation of a climate change policy that has been helping the Government pursue sustained economic growth by addressing the challenges posed by climate change. The report acknowledged the limited scope for expanding water supplies and advised that Pakistan would have to improve the efficiency of water use in all the sectors, particularly in agriculture. It also warned of the risk of increased demand of irrigation water because of higher evaporation rates at elevated temperatures in the wake of reducing per capita availability of water resources and increasing overall water demand. The report predicted that the impacts on food security in the agriculture sector would mainly be through reduced crop productivity caused by extreme events (floods, droughts, and cyclones). Given these risks under the increasing pressure of a growing population, Pakistan has no option but to take major steps for increasing its land productivity and water-use efficiency. Winston Yu, Yi-Chen Yang, Andre Savitsky, Donald Alford, Casey Brown, James Wescoat, Dario Debowicz, and Sherman Robinson. This is a Chapter No:#2 The Current Water and Agriculture Context, Challenges, and Policies in the book "The Indus Basin of Pakistan: The Impacts of Climate Risks on Water and Agriculture"
ADB (Asian Development Bank) and World Bank. 2010. “Pakistan Floods 2010 Damage and Needs Assessment.” Pakistan Development Forum, Islamabad, November 14–15. Ahmad, M., and G. P. Kutcher. 1992. “Irrigation Planning with Environmental Considerations: A Case Study of Pakistan’s Indus Basin.” World Bank Technical Paper 166, World Bank, Washington, DC. Ahmad, S. 2005. “Water Balances and Evapotranspiration.” Background paper for Pakistan’s Water Economy: Running Dry. Washington, DC: World Bank and Oxford University Press. Amir, P. 2005a. 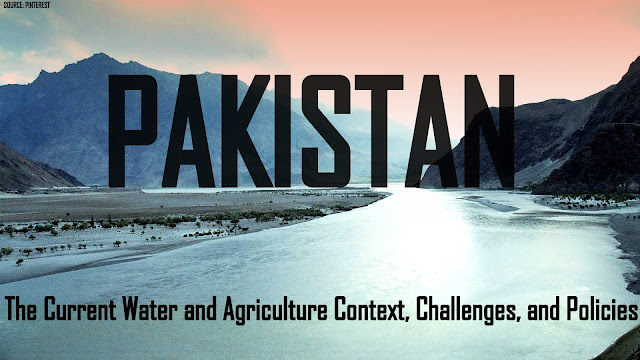 “Modernization of Agriculture.” Background paper for Pakistan’s Water Economy: Running Dry. Washington, DC: World Bank and Oxford University Press. ———. 2005b. “The Role of Large Dams in the Indus Basin.” Background paper for Pakistan’s Water Economy: Running Dry. Washington, DC: World Bank and Oxford University Press. Bedi, Baba Pyare Lal. 2003. Harvest from the Desert. The Life and Work of Sir Ganga Ram. Lahore, Pakistan: NCA. Berger, L. I., and IAC. 2011. “Preparation of Regional Plan for the Left Bank of Indus, Delta, and Coastal Zone for the Sindh Irrigation and Drainage Authority.” http:// www.sida.org.pk/download/lbg/phaseIII/Volume%20I%20&%20II%20-%20Draft. pdf. (accessed January 28, 2013). Bhatia, R. 2005. “Water and Growth.” Background paper for India’s Water Economy: Bracing for a Turbulent Future. Washington, DC: World Bank and Oxford University Press. Bhutta, M. N., and L. K. Smedema. 2005. “Drainage and Salinity Management.” Background paper for Pakistan’s Water Economy: Running Dry. Washington, DC: World Bank and Oxford University Press. Blackmore, D. and F. Hasan. 2005.“Water Rights and Entitlements.” Background paper for Pakistan’s Water Economy: Running Dry. Washington, DC: World Bank and Oxford University Press. Briscoe, J., and U. Qamar, eds. 2006. Pakistan’s Water Economy: Running Dry (includes CD of background papers, 2005). Washington, DC: World Bank. Falkenmark, M.,A. Berntell,A. Jägerskog, J. Lundqvist, M. Matz, and H.Tropp. 2007.“On the Verge of a New Water Scarcity: A Call for Good Governance and Human Ingenuity.” SIWI Policy Brief. Stockholm International Water Institute, Stockholm. FAOSTAT (Food and Agricultural Organization of the United Nations Statistical Database). 2012. Database of Food and Agriculture Organization of the United Nations, Rome. http://faostat.fao.org/. Gilmartin, D. 1994. “Scientific Empire and Imperial Science: Colonialism and Irrigation Technology in the Indus Basin.” Journal of Asian Studies 53: 1127–49. Government of Pakistan, Ministry of Food, Agriculture, and Livestock. 2010. Agricultural Statistics of Pakistan 2008–2009. Islamabad. Government of Pakistan, Private Power and Infrastructure Board. 2011. Hydropower Resources of Pakistan. Islamabad. http://www.ppib.gov.pk/hydro.pdf. GPPC (Government of Pakistan, Planning Commission). 2005. Medium-Term Development Framework, 2005–2010. “Chapter 27: Water Resources”, Table 5. Islamabad. http://pc.gov.pk/mtdf/27-Water%20Sector/27-Water%20Sector.pdf. ———. 2007. Vision 2030, “Chapter 6: Agricultural Growth: Food, Water and Land.” Islamabad. http://www.pc.gov.pk/vision2030/Pak21stcentury/vision%202030-Full.pdf. ———. 2009. Final Report of the Task Force on Food Security. Islamabad. ———. 2010. Task Force on Climate Change Final Report. Islamabad. Hussain, I., R. Sakthivadivel, U. Amarasinghe, M. Mudasser, and D. Molden. 2003. Land and Water Productivity of Wheat in the Western Indo-Gangetic Plains of India and Pakistan: A Comparative Analysis. Research Report 65, International Water Management Institute, Colombo. IMF (International Monetary Fund). 2010. Pakistan: Fourth Review Under the Stand-By Arrangement, Requests for Waivers of Performance Criteria, Modification of Performance Criteria, and Rephasing of Access. Staff Report; Staff Statement and Supplement; Press Release on the Executive Board Discussion; and Statement by the Executive Director for Pakistan. IMF Country Report 10/158. Washington, DC (accessed October 21, 2012). http://www.imf.org/external/pubs/ft/scr/2010/cr10158.pdf. Jensen, M. E. 2007.“Beyond Irrigation Efficiency.” Irrigation Science 25(3): 233–245. Kumar, M. D. 2003. “Food Security and Sustainable Agriculture in India: The Water Management Challenge”. Working Paper 60, International Water Management Institute, Colombo, Sri Lanka. Michel, A. A. 1967. The Indus Rivers: A Study of the Effects of Partition. New Haven, CT: Yale University Press. Molden, D.,T. Oweis, P. Steduto, P. Bindraban, M.A. Hanjra, and J. Kijne. 2010.“Improving Agricultural Water Productivity: Between Optimism and Caution.” Agricultural Water Management 97 (4): 528–35. Mustafa, D., and D. Wrathall. 2011. “Indus Basin Floods of 2010: Souring of a Faustian Bargain.” Water Alternatives 4 (1): 72–85. Panel of Economists. 2010. Final Report, Panel of Economists, Medium-Term Development Imperatives and Strategy for Pakistan. Government of Pakistan, Planning Commission, Islamabad. http://pide.org.pk/pdf/Panel_of_Economists.pdf. Siddiqi, A., J. Wescoat, S. Humair, and K. Afridi. 2012. “An Empirical Analysis of the Hydropower Portfolio in Pakistan.” Energy Policy 50 (November): 228–41. United Nations Population Division. 2012. “Population Prospects.” http://esa.un.org/ unpd/wpp/unpp/panel_population.htm. Van Steenbergen,F., and M.S.Gohar.2005.“Groundwater Development and Management in Pakistan.”Background paperfor Pakistan’s Water Economy: Running Dry.Washington, DC: World Bank and Oxford University Press. WAPDA (Water and Power Development Authority). 2004. Water Resources and Hydropower Development Vision—2025 (Revised). Government of Pakistan Water and Power Development Authority, Lahore. Wescoat, James L., Jr., S. Halvorson, and D. Mustafa. 2000. “Water Management in the Indus Basin of Pakistan: A Half‑Century Perspective.” International Journal of Water Resources Development 16 (3): 391–406. World Bank. 2006. Pakistan Strategic Country Environmental Assessment, vol. 2, Technical Annex: The Cost of Environmental Degradation in Pakistan—An Analysis of Physical and Monetary Losses in Environmental Health and Natural Resources. Report 36946- PK. World Bank, Washington, DC. ———. 2012a. “Indus Waters Treaty.” http://web.worldbank.org/WBSITE/EXTERNAL/ COUNTRIES/SOUTHASIAEXT/0,contentMDK:20320047~pagePK:146736~piPK: 583444~theSitePK:223547,00.html.